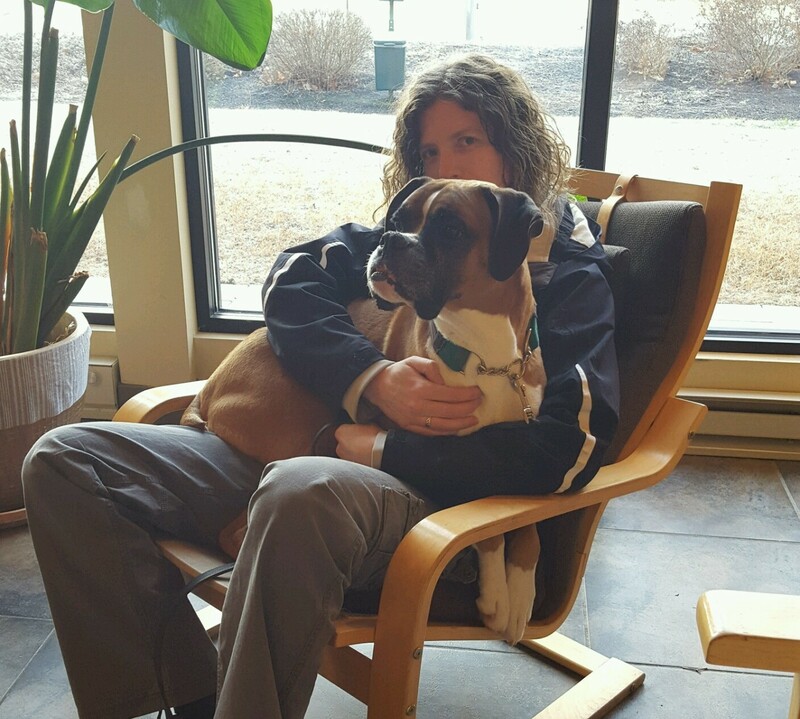 Degenerative Myelopathy: Body Betrayal | All Around Dogs Degenerative Myelopathy: Body Betrayal | Thoughts on training and life with dogs. Anyone who’s read Dash’s history knows that his body has not been very kind to him. Spinal meningitis at 7 months old. Vaccine reaction at 1 year old. Thyroid bottoming out at 2 years. A handful of smaller issues through the years. But now he (we) face a much bigger betrayal than ever before – one that we cannot treat, avoid, or level out. On November 15th I noticed the first symptom of Degenerative Myelopathy (DM) which is essentially canine ALS. It is hard to think about the road ahead. The slow progressive loss of function in his back legs. That, at some point, his “freak nub” will no longer be able to wiggle and thump at us. That he will likely still have an active mind and happy spirit when we have to make the decision to let him go. When they say this disease is painless, that is referring to the dogs. Cursed with our human awareness of how things will go, those who love him have already felt some pain and we will feel much more before our journey with him is through. Dash finds a solution to the slippery floors in the waiting room. But we will also feel joy. There is a small group of people who make up Dash’s circle and we will have many chances to enjoy the little things that make endear him to us. He will pin us to the couch and make his little groaning “uh uh” noises when we tell him it’s time to get up (unless we mention food, in which case, what are we waiting for?). He will wrinkle his brow, tilt his head, and smile in a way that never fails to charm. He will beat the snot out of a slipper, shoe, or toy when he’s overexcited and trying very hard to put energy in the right place. Last week I discovered that his left foot isn’t flipping immediately anymore. It isn’t as slow as the right side, but there has definitely been a change. It was tough to see and I struggled to focus on the joy for a bit. I had to be reminded to enjoy the walk after I saw him bunny hop on our stroll around the neighborhood. I remembered to be proud when we walked past a baying hound with relative success and a quick return to normal walking. I ran him through a couple of exercises for his daily ‘nana and took note of all the strength he still has. Now I could get preachy about cherishing every moment you have, you never know when they’ll be gone, etc. Honestly, that advice sometimes makes me feel a bit guilty for the days when I come home and distractedly disappear into a laptop. While it is important to cherish my time with him, I shouldn’t beat myself up for the time when he’s available and I’m not (either physically or mentally). I remind myself that he doesn’t chastise me for being “absent” and when he really needs me, he always let’s me know. But there is another lesson that I see in this tale – never give up on your problem dog, keep trying and playing with things together. Because here’s the thing… all the things that we tried and played with have helped him come this far. The skills he has learned will help him get a little further than he would have without them. 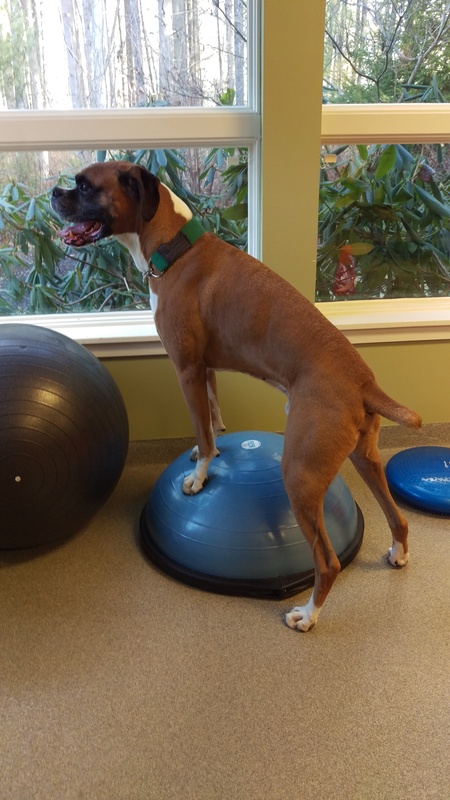 When we had his rehab consult, they were pleased with his strength and agility and they were impressed by the number of things he knew. Those things came from taking him to some agility lessons when he stopped being able to go to group classes, playing with him when I trained Xena or Delta in new skills, and just generally enriching our bond and our life together. Heck, we may not have been able to have a successful consult if we hadn’t worked on his behavior. And, just in case you start to feel guilty about not doing “enough” with your problem dog, understand that I wasn’t constantly dedicated to learning and training new things with him. My competition goals with the other dogs often took up the time and money I had available, so we stopped doing private agility lessons or didn’t go as far into NoseWork training as we might have. But I would always circle back to him, trying a new trick or learning a new skill. My point is this – There are many moments in a canine lifetime and if you spend just some of those learning together, you’ll both be better for it.